Bubble Stick Molds are perfect molds for creating reusable bubble cakes that can be swirled around the bathtub to add color and fun! 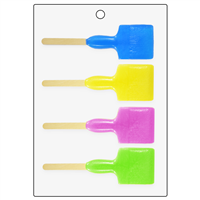 Each mold has a fun design with a popsicle stick insert. 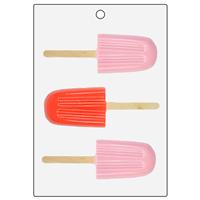 The Ice Cream Treat Bubble Stick Mold can be used to create bath treats that look good enough to eat! Use this mold to make bubble cakes that can be swirled around the bath tub using the stick. 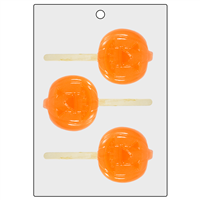 The Jack-O-Lantern Bubble Stick Mold is the perfect way to create spooky bath treats without any tricks! This mold can be used to make pumpkin shaped bubble cakes on a stick that can be swirled around warm bath water. Create reusable bubble bars that can be swirled around the bathtub using this Paint Brush Bubble Stick Mold. To use, swirl the bubble stick around in warm bath water like a paint brush on a canvas to create colorful, scented bubbles! Create smiling bubble cakes to swirl around the bath tub with the Smiley Bubble Stick Mold. Simply pack your Bubble Cake mixture into the mold with a popsicle stick and allow to harden, then unmold for a smile! 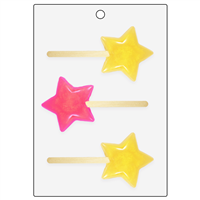 Make a "magic wand" bubble cake with the Star Bubble Stick Mold. These magic bubble wands are perfect for children and anyone who wants to make bath time magical! 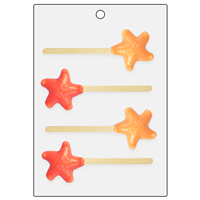 The Starfish Bubble Stick Mold is perfect for mermaid, beach or summer themed bath product lines. Scent your bubble cake with a beach fragrance, such as Salt Water Mermaid Fragrance Oil 791, and swirl around the bath until you reach your desired amount of bubbles, color and fizz! 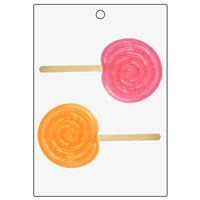 This Swirl Lollipop Bubble Stick Mold can be used to create adorable lollipop shaped bubble cakes that look and smell like candy! These fun bubble sticks that color and fizz in bath water can be used multiple times or all at once. Material: Plastic Avg. Bar Weight: 1.50 oz.